Friedrich August Moritz Retzsch (December 9, 1779, Dresden - June 11, 1857, Oberlössnitz/Radebeul) was a German painter, draughtsman, etcher, and winer. Retzsch joined the Dresden Academy of Arts in 1798 under Toskani and Grassi, later working autodidactically, copying the famous pictures of the Gemäldegalerie, among them a copy of the Sixtinian Madonna. 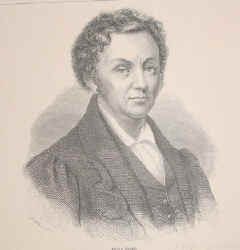 He was made a member of the Academy in 1817 and professor in 1824. The Cotta publishing house commissioned illustrations for Goethe's Faust, which made him financially independent. Goethe liked his work, and he illustrated works by other famous authors, among them Schiller and Shakespeare. Many of his works were created in house in the Lößnitz, with a view of the Elbe valley. As a winer, he was a member of the Saxonian winer association from 1799 onwards.